A Blog Dedicated To Inspiring Better Marketing ... Because Better Marketing Changes The World. If I told you that you could buy a new book on Word of Mouth Marketing starting tomorrow on Amazon for $45 and that it was a quarter the size of a regular book and in paperback, what would you tell me? Now what if instead, I told you the entire book was available as a free PDF download from one of 20 selected blogs (including this one) starting today for you to read first. 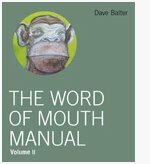 This PDF is part of a new social experiment that Dave Balter and the rest of BzzAgent are launching around Dave's new book: The Word Of Mouth Manual - Volume II. The book is only being made in an exclusive run of several thousand copies, and being released simultaneously on 20 top blogs around the Internet. The idea is to whet your appetite for the book and encourage you to buy a print version. The book itself will be part of a series of limited editions that come with a "water-proof cover" and a hand designed bookmark from BzzAgent's Artist-in-Residence, Seth B. Minkin. What Dave and the entire BzzAgent crew know about word of mouth is that it is an unstoppable force that is based on giving people something to talk about. Nothing does that faster than offering something exclusive and limited. That's the real secret to WOM. So check out your free copy of Dave's new book by downloading it online here, and then spread the word about it. According to other reports, this 'refer a friend' link had very little impact on the success of hotmail as a whole - the idea of hotmail, being the first free email on the web, was interesting enough in itself to spread naturally via word of mouth, much of it being to people who didn't have an email address in the first place to be referred via email! For millions of people Hotmail was (and is) their first email address. They could have only been attracted by other means. I'm a big fan of Dave Balter and BzzAgent. It's a Brilliant idea, well executed. In fact Dave is our podcast guest this month on Personal Brilliance - Up Close and Practical. A new episode each week this month. Listen to Dave describe the process. Catch up by clicking here. Your style and contents are mind blowing! Your achievements humble me. I salute you Rohit! Thanks for the download. I love being a volunteer BuzzAgent, so I hope Dave's book will give me some insight into being a better WOM'er.